Highbridge Station — Manhatta Architecture, P.C. The economic decline of the Highbridge neighborhood in the mid-twentieth century was in large part the result of the elimination of three critical pieces of infrastructure. 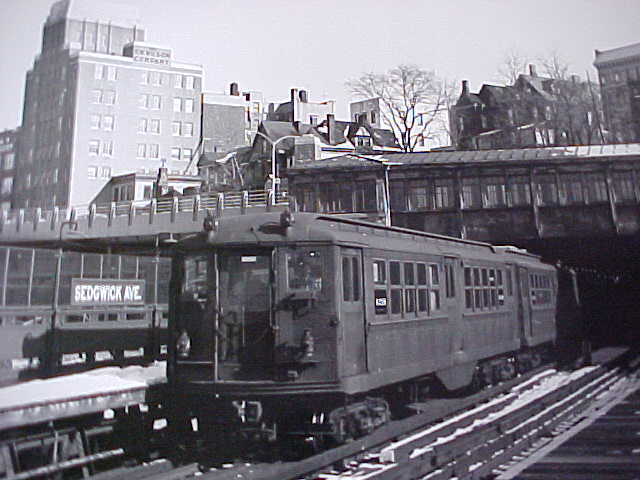 In 1958, the Polo Ground Shuttle was demolished eliminating Sedgwick Avenue and Anderson-Jerome Avenues subway stations. Around the same timeframe, the Putnam Railway closed eliminating Sedgwick and Highbridge regional rail stations. Later in the 1970's, the Highbridge pedestrian bridge was closed further isolating the neighborhood. New York City commenced the restoration of the Highbridge pedestrian path in 2012. Inspired by this project, Manhatta Architecture sought to explore the possibility of restoring subway service to the Highbridge neighborhood via a 3 Train extension. Doing so will benefit the transit starved Highbridge neighborhood and reduce game-day congestion. Highbridge Station is more than just a subway station. It will offer much needed amenities to area residents including a fresh foods market and fitness center. Highbridge Pub will serve as a social space for residents and visiting sports fans. A youth hostel will provide affordable lodging and attract international tourism to further add to diversity of the borough. Finally, a public commons will provide a place to meet, relax and enjoy the beautiful borough of the Bronx. 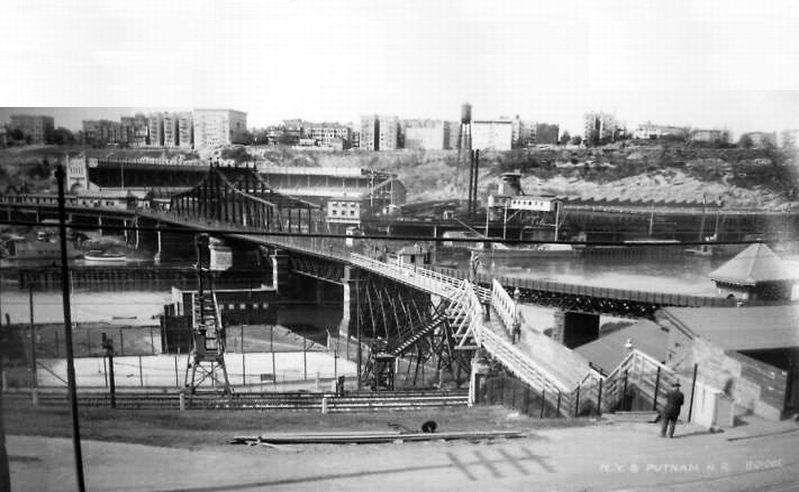 Putnam Bridge was a swing bridge that spanned the Harlem River and the adjacent tracks of the New York, New Haven & Hartford Railroad in New York City, connecting the boroughs of Manhattan and the Bronx near the current location of Yankee Stadium. It carried two tracks of the New York & Putnam Railroad, and later the 9th Avenue elevated line of the IRT, as well as two pedestrian walkways outside the superstructure. 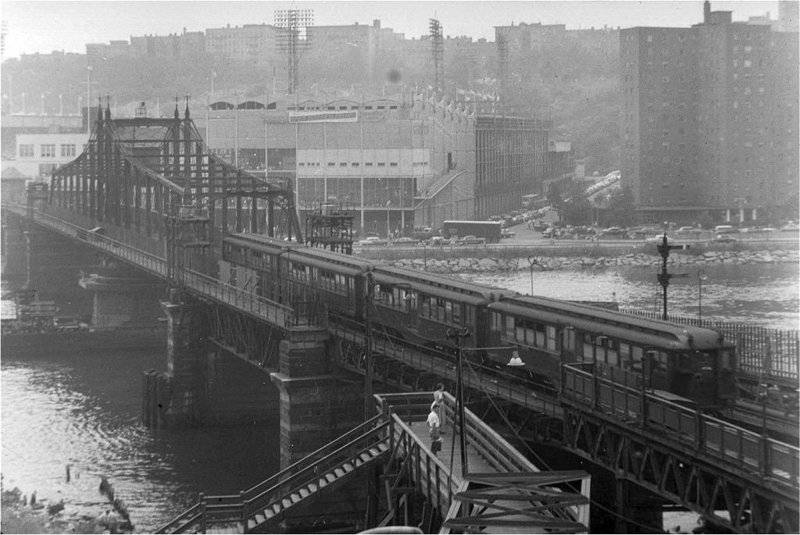 This view is looking from Highbridge across the Harlem River at the former Polo Grounds. Sedgwick Avenue was an elevated, ground level and underground station on the Bronx extension of the IRT Ninth Avenue Line. This station was built to connect to the New York & Putnam Railroad passenger trains that terminated there instead of the former 155th Street terminal and New York Central Railroad Hudson Division trains that stopped at the new (1918) platforms at this location. This station remained in use by the Polo Grounds Shuttle until 1958. This station was built extending from the tunnel entrance to Jerome Avenue on the side of a cliff on a steel structure spanning the tracks of Metro-North's Hudson Line that connected to the existing Putnam Bridge, which had been built for the New York City and Northern Railroad. The station street entrance and mezzanine was above the tracks on Sedgwick Avenue. 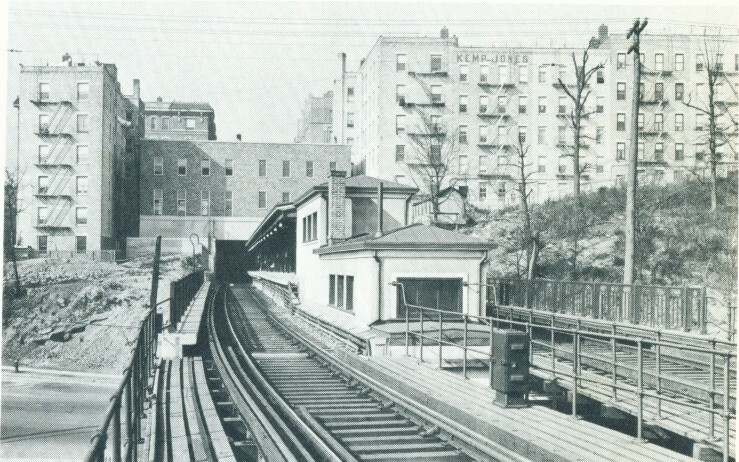 The tunnel from Sedgwick Avenue to Anderson–Jerome Avenues was built to NYC Elevated Railway standards. Those standards specified the clearance between the tracks and the sides of the tunnel only allowed for the "El" type open third rail instead of the covered third rail in use on the IRT Subway. The standard distance from the center of the track to the center of the El type open third rail-head is a few inches shorter than the distance to the subway type covered third rail-head. This incompatibility prevented the line from being used in the future by standard IRT Subway equipment, and brought about the line's demise instead of being linked to the IRT Lenox Avenue Line at 148th St in Manhattan, which had been proposed by the NYC Board of Transportation in 1940. Ultimately, the demolition of the Polo Ground Shuttle was short-sighted. The negative impacts of New York City's failure invest a relatively small amount to retrofit the tunnels facilitated a multi-generational economic depression of an entire neighborhood. Given the scope of work required to bring the line back in service, this technical issue can easily be addressed as part of the larger restoration. Anderson–Jerome Avenues was an elevated station on the Bronx extension of the IRT Ninth Avenue Line in use from 1918 until 1958. The reinforced concrete station structure extended from the end of the tunnel from the Sedgwick Avenue station over Jerome Avenue. The tunnel emerges from the basement of a building on Anderson Avenue. A portion of the island platform is in the tunnel. The station had entrances at each end of the structure on Jerome Avenue and Anderson Avenue. The High Bridge (officially, the Aqueduct Bridge) is a steel arch bridge, with a height of almost 140 feet (40 m) over the Harlem River, connecting the New York City boroughs of the Bronx and Manhattan. The eastern end is located in the Bronx near the western end of West 170th Street, and the western end is located in Highbridge Park in Manhattan, roughly parallel to the end of West 173rd Street. Completed in 1848, it remains the oldest surviving bridge in New York City—although much of the current bridge dates from a 1928 renovation. The bridge has been closed to all traffic since the 1970s, with plans for a 2014 reopening.